There are hardwood floors that have truly stood the test of time by lasting for more than one hundred years. The cheap imitation stuff will never be able to do that. 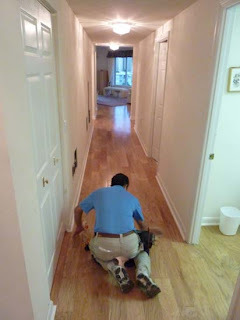 With true hardwood floors, you will find that cleaning is a lot easier and that they are hypoallergenic. This means that those who have certain allergies in the house will not suffer so much. And since the legit hardwood floors are so much easier to keep up with when it comes to cleaning, you will find that they are going to look a lot better than the laminate flooring would. Hardwood Flooring in Lauderdale-by-the-Sea by Face Of Wood Flooring, Inc.
Not only do you want to think about the look of your floors and the quality of the material used, but what about the chemicals? Yes, there are many chemicals found in laminate flooring, such as voc and formaldehyde. Are these chemicals that you really want to bring into your home? Of course not and that is why you are going to want to make sure that you are doing what you can to put nothing but the true solid hardwood floors in your home when it comes time to renew the floors. Sure, the initial price might be a little higher, but when you consider the value that you are really getting with the hardwood floors, you will see that it is more than worth the little bit of extra money.